PAX East is just a couple weeks away and I figured I'd write some tips of how to handle the somewhat overwhelming event that can be PAX! Boston is a special place (for better or for worse) figured I'd share some tips from places to eat and drink, emergency places to get stuff and getting around. Hopefully some of this will come in handy! So Much Snow. Pack Accordingly! Let's be honest here, Boston is getting HAMMERED this year. By the time PAX East starts, they will have had over 100 inches of snow since January 1st. Long term forecasting is terrible, but I would seriously look at packing for sub-freezing tempatures. Boston is a great city to walk around in, but it can be a pain to get to specific area. Cab drivers are jerks, Uber is new, the T stops at 12 AM and let's not forget that they are digging out of 58.5 inches of snow in Feburary on top of the 43.3 inches in January. Sidewalks might be covered in snow! MBTA or The T is one of the easiest ways to get around Boston. Using the Silver Line from the airport to Convention Center to getting into downtown or other areas such as Cambridge or Copley Square or Kenmore (Fenway stop). Using the T is super easy and MBTA offers an unlimited 1 week card for $19. With all the snow, the T might be one of the easiest ways to get around! Cabs in Boston are notorious for broken card readers. Do yourself a favor and stop at the bank and always have cash. Nothing worse then getting in a cab getting to your destination and finding out that the driver can't take your card. Boston now has Uber, which is super helpful for not carrying cash. This might be the first PAX East where having slicks will be important. Pack some shoes that you will wear on the floor AND shoes to walk around town in probably weather proof to some degree. Boston has a lot of great places to eat and drink, but they might be a little hard to find. There are especially some gems right near the Convention Center! Just a couple blocks from the Convention Center is Flour Bakery. This place has tons of tasty treats including their house made Oreos, Poptarts and other goodies. They also have some amazing sandwiches. It is well worth the short walk to check it out! If you are serious about your alcohol then you really must stop at Drink. Again just a short walk from the Convention Center, Drink is the type of place where you just tell the Bartenders what you like and they will make something and you will love it. Staying right in the same neighborhood, Lucky's Lounge is a great resturant and bar. Really playing off a motown vibe, Lucky's is loud and fun. I'd recommend Mac & Cheese. It is awesome! If you want a nice cold beer then walk over to Harpoon Brewery. 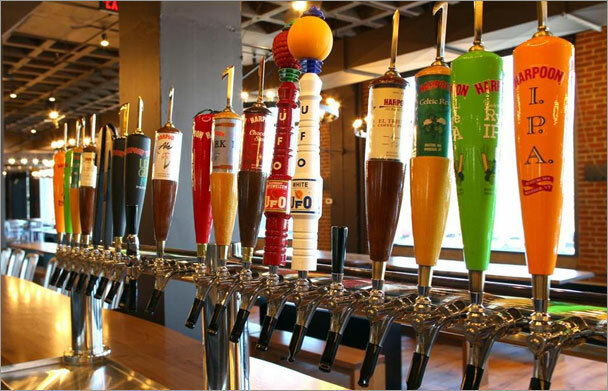 A short walk from the Convention Center, Harpoon Brewery has a new nice Beer Hall with tons of signature beers on tap! A total hole in the wall bar right in the middle of the Theatre District. This place is perfect place to grab a bite to eat and a drink after working the floor all day long. Also be sure to check out the artwork behind the bar. Classy! Right next door to Intermission Tavern is The Tam, a total dive! They have a 15 foot neon Michelob and Budweiser above their door! This is a great place to start or end your night! Jacob Wirth is a stable of Boston. A classic Baravian Bar right in the heart of the Theatre District Jacob Wirth is a great place to grab a bite to eat. If you are to go, make sure you try to go on Friday Night which is Sing Along Night. Grab a pint and sing some classic pub songs. After a long day on the floor and a long night out on the town you need a place to recharge and Eastern Standard is the place to go. Huge mirrors, great drinks and oysters until 1:30 AM. Makes a trip all the way to Fenway worth it! Pour House is just that, a great place to get cheap eats. Known for being a resturant that local college students can afford, it actually is a great lunch spot. My friend Steph in Boston would stop talking to me if I didn't include El Pelon Taqueria! This tiny authentic Mexican eatery is great! It is so popular that it burned down even after being closed for over a year, it returned to full lines! Go there and take your photo! This is the place to go if you want a burrito! I don't even drink beer that much and I've been kicked out of this place! CBC is known for their beer towers. Serious, they serve beer in a tower to your table. Another late night spot is Uni. During the day it is a great place for Omakase, but after 11 PM on Friday and Saturday nights it turns into a ramen den. With the tempature probably being below freeze this might be a popular place. Boston's ONLY 24 hour resturant in the city limits. If you are out LATE this is your only option. Seating is very limited though. For those of you who are working PAX East it isn't uncommon to run into an emergency. Batteries, cables, television? Seriously who knows what could go wrong, but here are some places to be aware of as they might save you. MicroCenter is a true computer store the size of a super market. Anything and everything you could need is at this store. From USB drives, motherboards, video cards, cables for anything you can think of and more. If something happens with your gear, this is the place to go to solve it. Note: There is also a Trader Joe's in the same parking lot! There used to be a Best Buy right off Mass Ave, but it closed. So if you are looking for a chain eletronics store you have to go south a little to South Bay Center, which has a little of everything. About two miles away from the Convention Center, it isn't too bad of a trek if you in an emergency. Did your posters get messed up in transit? Well Alpha Graphics can handle it! They have an office right downtown, though they do close at 5 PM on Friday.